218 pages | 7 B/W Illus. Critical approaches to leadership studies have sought to challenge the normative position of leadership as residing solely within the formal leader and have gone as far as to undermine the traditionally held assumption of leadership as a "real" phenomenon. The book offers a critical account of the nature of leadership and management in modern organizations. Specifically it examines the forces that affect the influence relationships between leaders and followers in public sector organizational settings and thus, how these relationships inform social influence processes. Although the book focuses on the case of a public sector organization in the UK, the findings are placed in the context of both leadership theory and research across the globe and the dissemination of 'new public management' worldwide. 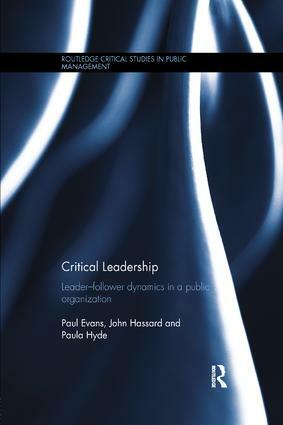 By acknowledging the criticisms concerning the weaknesses of conventional or mainstream leadership study and through the adoption of a critical perspective, Critical Leadership provides a deep and rich interpretation of the empirical material on leadership, thus making an outstanding contribution to the current literature.